Browse : Home Video Marketing Will Discontinuing YouTube Annotations Affect Video Bloggers? Will Discontinuing YouTube Annotations Affect Video Bloggers? 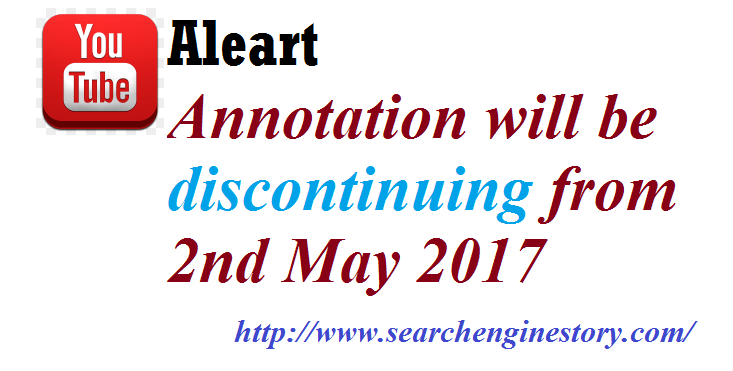 Google has announced that starting May 2nd, 2017, it will no longer offer the services of Annotation Editor. Annotations in this case are basically texts or hot spots or even links that are linked to a video that you get to see when the video ends. They are meant to encourage viewers for the reason of “call for action”, which comprises subscribing or viewing another post or video when you click on the annotations. They help in connecting you to another website or video by means of links. Citing the reason, the search engine major stated that ever since its Cards and End Screens came into existence, these video annotations had become less significant. Also, it stated that these video annotations work best when you are watching a video on a desktop. In fact, it said that the use of these annotations has reduced by more than 70% ever since mobiles became popular and started being extensively used instead of desktops for surfing and navigating websites or watching videos. One of the main reasons for discontinuing the concept of annotations is that since majority of the people are online on their hand held devices or on mobile, it does not make sense in adding these annotations that will hardly be seen by people. Also, as more and more people have turned to their mobiles to view YouTube videos, the time and effort spent on creating these annotations is wastage. • End Screens and Cards generate more web traffic than these annotations and the difference is quite a lot as much as 7 times greater. • Also, most of the viewers have a tendency either to close annotations or never click on one at all. • The time spent to create annotations is more than incorporating the End Screens and Cards and the latter is ten times faster and easier to set up. • They (End Screens and Cards) are able to keep viewers engaged for longer periods of time. Once Google discontinues the Annotation Editor, creators of these annotations will not be able to create and use one. As such, all you can do is remove or delete the annotations once and for all. However, the annotations that are already tagged with a video will remain as they are and they will also be visible and viewable provided these videos are played or watched on a desktop. The so called End Screens and Cards work in the same manner as do these annotations helping you with creating links to the different videos you want to. They also help you to find out results of poll review and recommend videos. Citing few features that were incorporated by Google, it said that when viewers wanted videos within a playlist, it made it available for the viewers. Next, when they asked for a feature that would enable the viewers to import End Screens from different videos, the same was incorporated. As such, discontinuation of the video annotations and enhancing the functionality of End Screens and Cards should in no way pose a problem to the viewers. It is in fact, trying hard to better the concept and the features on a regular basis depending on the needs of the viewers and inputs from them. The search engine major also stated that viewers were not quite happy the manner in which annotations worked or appeared on their desktops and majority of the viewers found them of little or no help. In fact, the concept these days is quite outdated.